labs: AERender (AE render droplet for OS X). . . | andrewANDORU. . .
Just like the MayaRender app, but for After Effects. A quick and easy way to launch AE renders without using the resources necessary to load up the After Effects UI and load each preview frame into memory. Plus this gives you the ability to launch multiple renders at once if you so choose. Essentially just another way to render in the background (inspired by Lloyd Alvarez’s great BG Render script on aescripts.com), but without ever having to open AE. Render speeds should also be slightly quicker this way as well since no resources are used by the app and only the render engine. Here is a quick demo of the AERender & AEae apps (both available in the “labs” section of this site. This is not a queueing app. This is a stand alone droplet that will startup seperate renders for any files dropped onto it. For queueing you can use my RenderQ app. –Set Double-Click behavior. . .
–Set drag and drop behavior. . .
–Set Check for prefs behavior. . . I have a same error message. Do you found a soluce to fixe this problem? wow, very usefull thanks a lot ! When I start AErender it says the script is uncompiled? EDIT or OK? This is awesome! Any chance of a PC version in the future? This is a godsend! Thanks so much Andrew and thank you community for explaining how to make this work with ae cs6. Hi! i’ve downloaded the cs5 version. When i want to use it, it says file “AERender” is damaged and con’t be opened. You should move it to Trash. I need help, whats wrong with it? I’m having the same problem. Were you able to solve this? Any info would help. Thanks! Thank you for your script! I’ve been using it extensively, but it stopped working for me today. It keeps looking for an older file that I rendered in the past, and not the file that I need to currently render. How would I fix that? Anyone knows if there is a version that works with Adobe CC? I installed AErender_v1.1.app , the universal version. and I don’t know where I should find it. What should I pointing at? 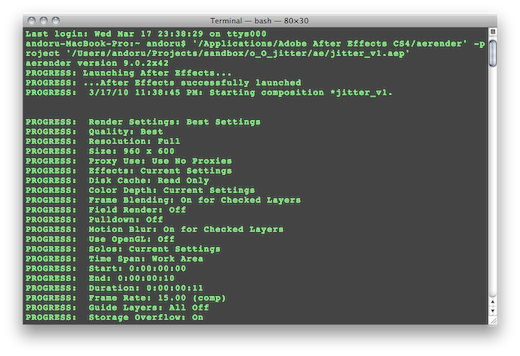 You need to select the “aerender” executable that is nested in the same folder as the After Effects application. What do I do? I also check in the main.script but I do not know which lines to change. Help please!! I did the same mistake, when prompted i pointed to the AE app dander than the aerender. Is there a plist I can delete so the droplet can work as if launched for the first time? 7. Repeat steps 1-4 to go back into the script you just changed. This was all I needed to do on my comp to get CC2018 renders going correctly through this app. I downloaded this but I don’t have a mac I use a windows 7. It doesn’t seem to be working. Is there a way to fix this? Have just one problem: If I select two projects using the aerender app, it will open two terminals and render th ae projects simultaneous. the two projects will render in sequence. It would be really fantastic if the app could do this. post. Thank you one million and please carry on the enjoyable work. Is there a windows version of this? Thank you so much for this plugin, I have been using it ever since I’m using AE CS5. After Effects error: The file you are attempting to open was created with After Effects version 13.2 (Macintosh 64) and cannot be opened with this version. is there are new version or a way which I can fix this issue? I’ve been using aerender for two years, it’s soooo useful. there are a work around for me, I try to save the .aep file down to CC2013 v12, then it would worked for me. Now it works like a charm!!! Pretty website by the way! I tried getting this to work for CC 2015 but haven’t had any luck. I opened up the coding in apple scripts editor and didn’t see anywhere where I could update the language. Anyone get this to work with cc 2015? Does anyone have trouble rendering Ray Traced 3D scene with AE Render? Does is support this feature? Has someone got this to work with CC 2015? Thanks. This will force the app to create a new preference file, and on the next run it will ask you to navigate to the aerender in the Adobe After Effects folder. I heard a lot of good feedback about AErender. So would be nice to get it working! My question is :could you write detailed step-by-step instructions from the moment of download: how to install it, activate and make it work, please? All the directories, scripts, etc. Anyone got this working on adobe2017 cc?